A residential villa or a holiday home which esthetic in art and location strategies are perfectly combined. Remarkable with the modern loft design, the Loft Natai highlights the creativity and the natural beauty of the real material. Its bright and airy structure enhances the natural light and ventilation, also allows the residents uniquely experience private and serene tropical living - beachfront yet lagoonside. 5-story building of the Loft Natai has been built on the area of 83 square wah with total usable area of 478 square metres. 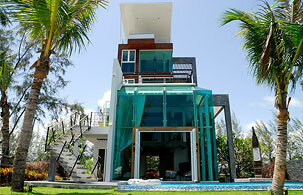 The villa comprises 3 bedrooms and 4 bathrooms. The ground floor has been designed as a functional area of the villa for living, cooking, dining, and outdoor living. The Loft Natai is tucked away in the small and peaceful community, adjacent to Ban Bor Dan Hot Spring, The Hotspring Beach Resort Resort and Spa, Aleenta Resort & Spa, and Ranyavati Hotel. Located 5 minutes from Khok Kloy Town in Phang Nga Province, the villa can be reached within 30 minutes from Phuket International Airport.